Though he was born in the United Kingdom, Corrado Primavera grew up in Rome and is married to Febe. They have four children. 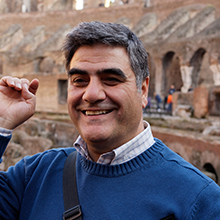 In addition to planting the Evangelical Church in Rome, he has worked as a historical consultant for Day of Discovery Television Production and has written extensively for Italian and English publications. Having majored in Ancient Roman History himself, in Italy, he is well qualified to teach The Ancient Roman World at Rome with Purpose.